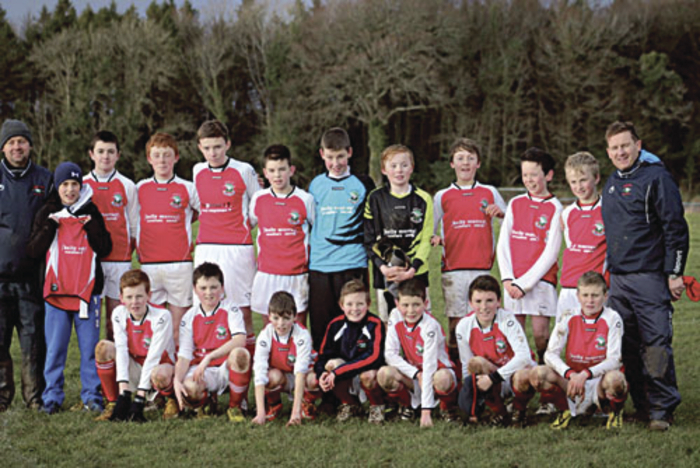 Colga u-13s advance to last 16 of SFAI Cup: Front row (l-r), Robert Silke, Michael Corless, Calum Browne, Kody McCann, David Lee, Christy Brennan, Liam Corcoran. Back row, Gerry Martin, Michael Donoghue, Conal Harkin, Luke Prendergast, Sean McDonagh, Tomo Culhane, Patrick Martyn, Robert Timmins, Eoin Lyons, Liam McDonagh, Ely Sheedy, Dave Silke. Colga produced a 3-0 victory over St Mary’s Cork last weekend to continue their impressive form in this SFAI u-13 cup which has included wins over Strand Celtic (Sligo ), Ballina Town, Tuam Celtic, and Mervue United. Last weekend’s game was played in penal conditions which did neither team any favours. St Mary’s started the game strong and it took great defending from David Lee, Liam Corcoran, Liam McDonagh, and Conal Harkin to keep the Cork team at bay. After 15 minutes Colga broke free and found the opening goal. Eoin Lyons, a scoring stalwart all season, nipped in behind the Mary’s defence to bag the goal, which helped settle the home side. The midfield of Tomo Culhane, Christy Brennan, Luke Prendergast, and Kody McCann slowly got to grips with the game, but after the break they were once again forced on the defensive, and Colga keeper Robert Timmins was forced into a string of fine saves. Having survived that threat, Colga produced goal number two when Tomo Culhane fed to Ely Sheedy, who spotted Luke Prendergast free on the left, and all it took was a precise touch from Prendergast and Colga had a 2-0 advantage. St Mary’s piled on the pressure in the next 10 minutes, while Colga introduced some fresh legs with Michael Donoghue, Michael Corless and Calum Browne and Robert Silke entered the fray. Within five minutes Donoghue claimed a great team goal to continue their passage in the national competition. As the club’s u-13s were putting in a sterling performance at home, in Naas the u-12s produced a stellar 1-0 win in their SFAI Cup. Colga, having dominated the first half, finally made the breakthrough midway through the second half when Liam netted the winner. Thereafter it was a case of heroic defending as Colga held on for a ground-breaking victory and a home draw against Portlaoise later this month.